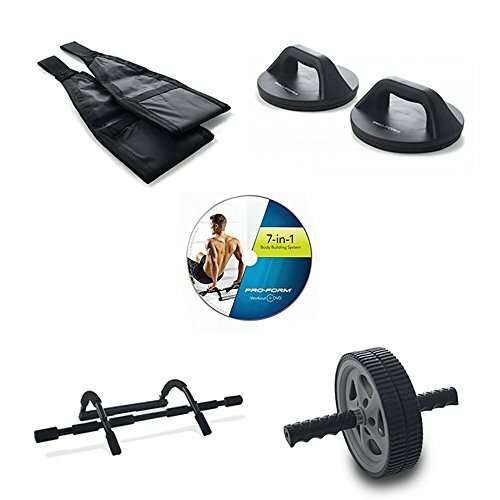 You can do it all and get an intense total body workout at home with the ProForm 7 in 1 Body Building Workout System. This set has everything you need to turn your beast mode on and transform your entire body. It includes a door gym, rotating push handles, ab and core straps, a toning wheel, a workout DVD, a nutrition guide, and an exercise chart. The door gym fits most standard door frames and doesn't leave you with damaging screw holes. The 7 in 1 system is compact, convenient, and sets you up for successful toning of your muscles, a stronger and more powerful physique, and an overall healthier and happier you. Eat clean, train dirty, blast your music, and work it out with this ProForm 7 in 1 Body Building System and you are on your way to a body you will feel good about. If you have any questions about this product by ICON Fitness, contact us by completing and submitting the form below. If you are looking for a specif part number, please include it with your message.